Negroni Week is upon us, that special time of year when strange concoctions appear on your local bar's menu, full of ingredients with unpronounceable Italian names like Cynar (it's pronounced "chee-nar," and it’s made from artichokes). It's a week where bartenders get to take an Italian classic cocktail, the Negroni, and stretch the definition of it until it's unrecognizable. But more than that, it's a fundraiser, with participating locations donating to charities of their choice for each of their "Negroni" sold. For real. Drinking for charity has never been easier. But just what the hell is a Negroni, aside from dry gin, sweet vermouth, and Campari? Why are people excited about it enough that almost 6,000 bars worldwide are signing up for a week dedicated to it? What, exactly, is this weird, bitter, bright-red drink your bartender is so enthused about making for you? Well, grab a seat and order a Negroni. Or two Negroni. That’s right. The plural is the same as the singular… there's a lot to learn here. Here's everything you’d want to know about the Negroni. With any drink, there's disagreement as to how to best make it. With the Negroni, it's argued that the drink should be built right on top of the ice it will be served on, stirred a bit, then joined by a bit of orange twist, which you can flame before adding to caramelize the oils, if you want to be fancy about it. Douglas Derrick of Ava Gene's in Portland, OR (more on him later) argues the drink is actually 1/1/1/1, with the last ingredient being water, in the shape of ice. Unlike other drinks, you want this one to change noticeably as you work on it, and it works on you. Campari is an amaro, a family of bitter Italian spirits. It's a bright, vivid red, but bitter and botanical, with some sweetness. It's hard to drink straight, but lovely with soda or even orange juice. It dates back to 1860, and was originally produced in Milan. One-third of a Negroni, it's (arguably) the only ingredient you can't change. Cappelletti from Italy. Calisaya from Oregon. Aperol, Campari's close cousin. All of these bitters are similar to Campari, and are often used in its stead in the Negroni and its variants. 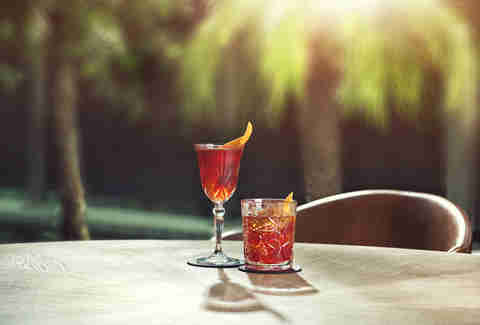 But in the end, there's nothing quite the same as Campari, and a Negroni isn't the same without it. Not the coffee kind. Back in 1860, Gaspare Campari, who made the spirit, had a bar: the Caffè Campari. There he made a drink called the Milano-Torino, a mixture of Campari (from Milan), sweet vermouth (from Turin), and soda water with a slice of lemon or orange. The story goes that the drink became so popular with expatriate Americans during Prohibition, that it was eventually changed to the Americano. Or so the story goes: around the turn of the century there was a Count Camillo Negroni, something of a libertine who spent considerable time in the United States as a gambler and cowboy. After the first world war he returned to Florence, Italy, where he was a mainstay at the Caffè Casoni. There, in 1919, he ordered his Milano-Torino with gin instead of soda (most likely declaring, "I need more alcohol in my alcohol!"). This drink became so popular that people would start ordering the Milano-Torino the "Negroni way." The count probably loved that. With all anecdotes involving cocktail history, it's important to take this story with a grain of artisanal pink Himalayan sea salt. However, there is ample evidence reporting a real Count Camillo Negroni, who did spend time in the US before returning to Italy, and was drinking at the cafe around 1919 when the Negroni first appeared. Take that as you will. 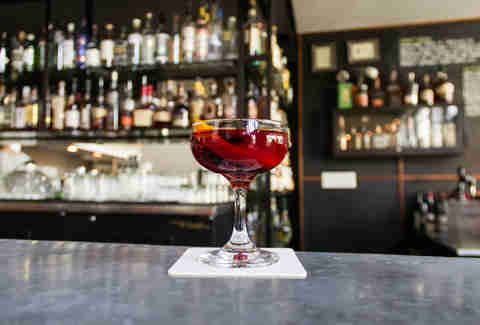 The Boulevardier -- the signature drink of expatriate writer Erskine Gwynne, who edited a Parisian journal of the same name during Prohibition -- substitutes bourbon or rye whiskey for the gin in a Negroni, making a richer, darker, and sweeter drink; The Old Pal, which first appeared in Harry MacElhone's book The ABCs of Cocktails in 1922, uses Canadian whiskey for the spirit, and uses dry vermouth rather than sweet; and the Negroni Sbagliato ("Mistaken Negroni," roughly translated) was reportedly created when a bartender somehow accidentally used prosecco instead of gin in a Negroni. Legendary actor Orson Welles discovered the cocktail while shooting Black Magic in Rome in 1947. He is quoted as lauding the drink’s balance, saying, "The bitters are excellent for your health, the gin is bad for you. They balance each other." Welles' statement has not been evaluated by the FDA. The century passed, cocktails fell out of favor, and ingredients were lost. Then, after the turn of the millennium, we were hit by the cocktail renaissance. New gin distilleries started popping up in England, the US, and beyond. Vermouth saw a resurgence with increased variety and quality. The Negroni started appearing on a few cocktail menus, then many more. And now we have an international week to celebrate it. What, exactly, happened? Like many other trends and fads, the drink started as a bartender favorite, then spread to consumers. At the time of its initial rise, most cocktails were either dark and sweet, like the Manhattan, dry and bracing, like a martini, or citrusy, with whiskey sours, margaritas, or the definitive drink of the '90s, the cosmopolitan. 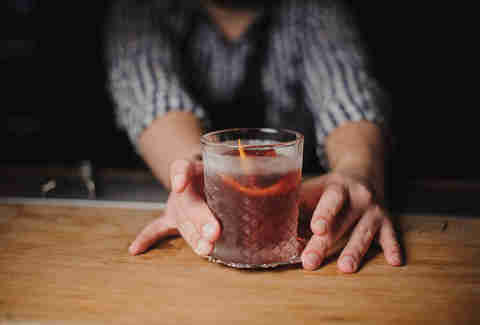 When the Negroni resurfaced, for many it was the first time a drink's primary flavor was bitter. It opened up the doorway to a new approach to cocktails. Both bartenders and bar-goers were thirsty for a new style, and the Negroni provided. Imbibe magazine, a drink-oriented publication, is based out of Portland. The magazine was inspired by Derrick's Negroni Social and took the theme internationally. 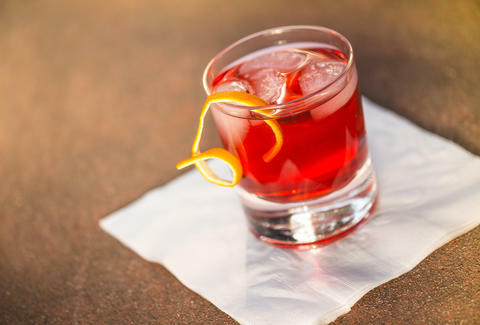 Together with Campari, it launched Negroni Week in 2013. The first year saw a few hundred participants. The next it grew to over 1,000. Now, in 2016, Negroni Week has spread to almost 4,000 bars and restaurants all over the world, and it is set to raise hundreds of thousands of dollars for charities. Now what? Well… you've got some charity work to do and some facts to regurgitate. Luckily, there are about 6,000 places ready to hook you up.